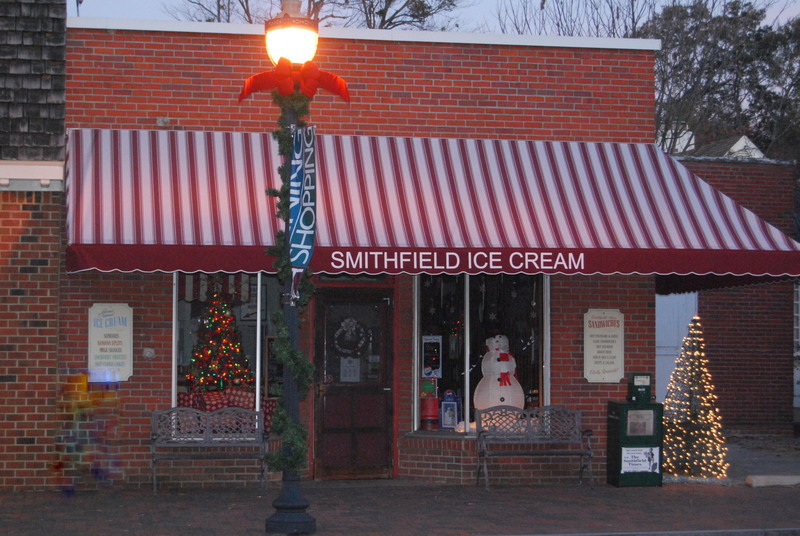 Smithfield isn’t my hometown, but it was where my Mom and I came shopping every Saturday morning all during my childhood and even into my teenage years. At that time, Smithfield’s businesses included a couple of grocery stores, a five and dime, two department stores, a jewelry store and a couple of drug stores. My little hometown of Bacon’s Castle had a whopping four gas stations/country stores, but that was it for shopping. A Saturday morning shopping trip to Smithfield was a big adventure. But I always wanted to get home in time to watch Sky King on tv. 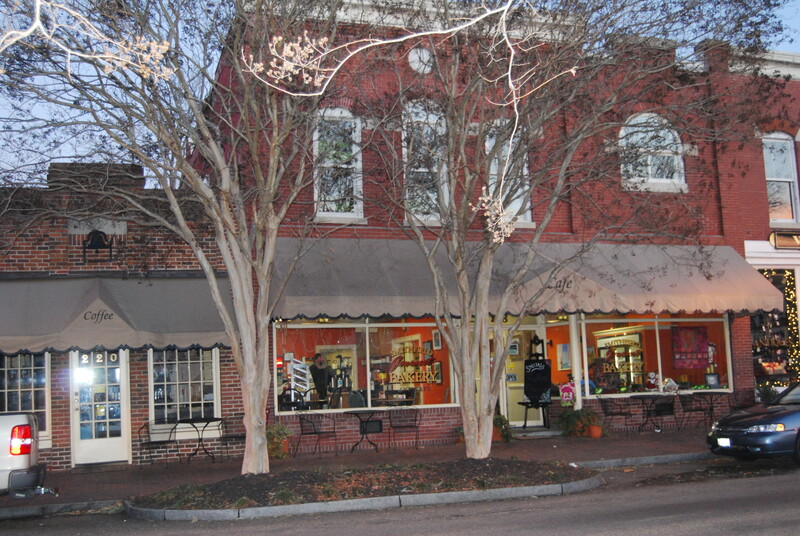 Smithfield Gourmet Bakery is located in this building now. In the days of my childhood, it was Little’s Pharmacy. There was a soda fountain there, and my Mom and I always stopped in for a lime-ade during our shopping trip. This is our small town ice cream parlor. Not only do they have good ice cream, but also delicious subs. Back in the day, this was The Flower Cupboard. I remember buying boutennaires for my prom dates here. Smithfield Flags now occupies this building. Years ago, it was the Chevrolet dealership. We never patronized that dealership: my Mom was a Ford woman. I DO, however, patronize Smithfield Flags. In my earliest memories, this was Betts Department Store. It remained a department store (Southern and then Peebles) for many years. 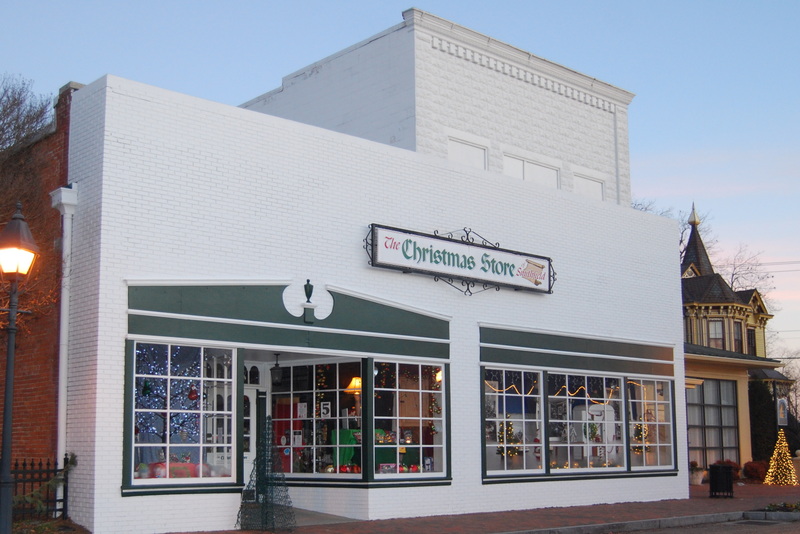 It’s now The Christmas Store, which is open year-round, but especially popular this time of year. 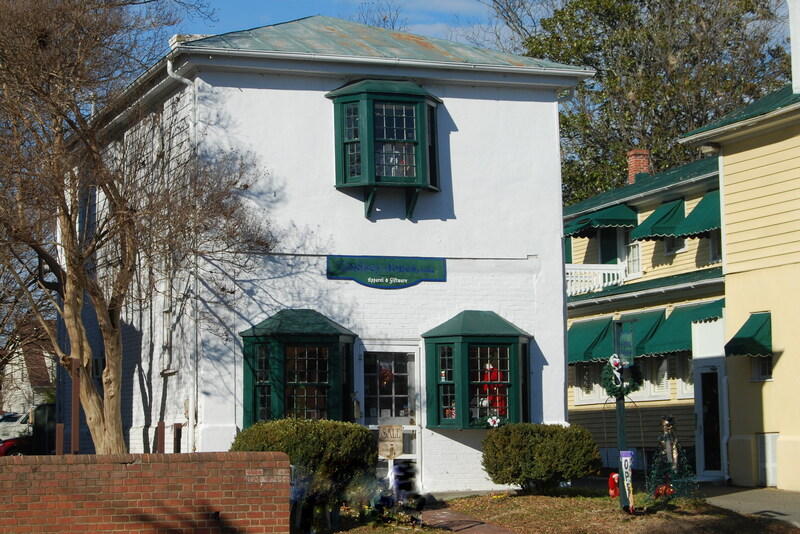 This little building is now Lindsay Jones Apparel and Gifts. It was the Lad and Lassie shop (childrens’ clothing) when I was a little girl. My Mom occasionally bought outfits for me there, including one that had gray woolen leggings. Those things itched like crazy, and I hated wearing them. 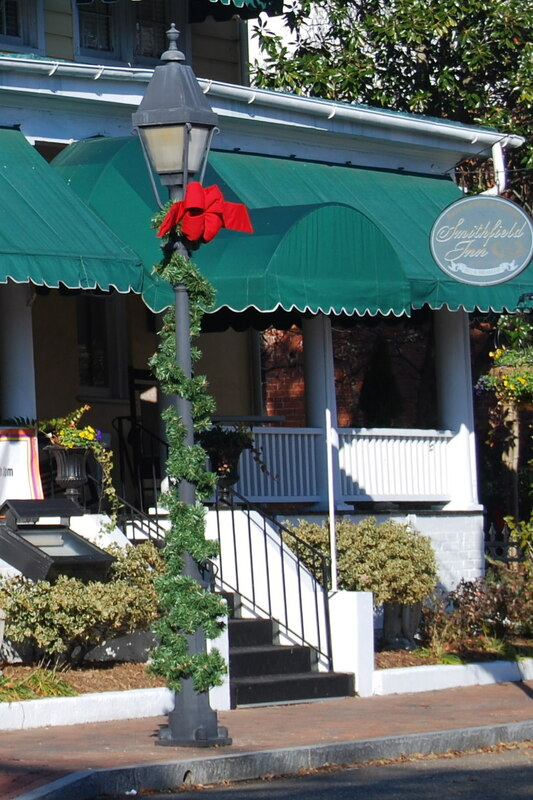 Years ago, before the town utility lines were underground, holiday decorations on Main Street in Smithfield were huge electric Christmas bulbs hung across the street on the power lines. 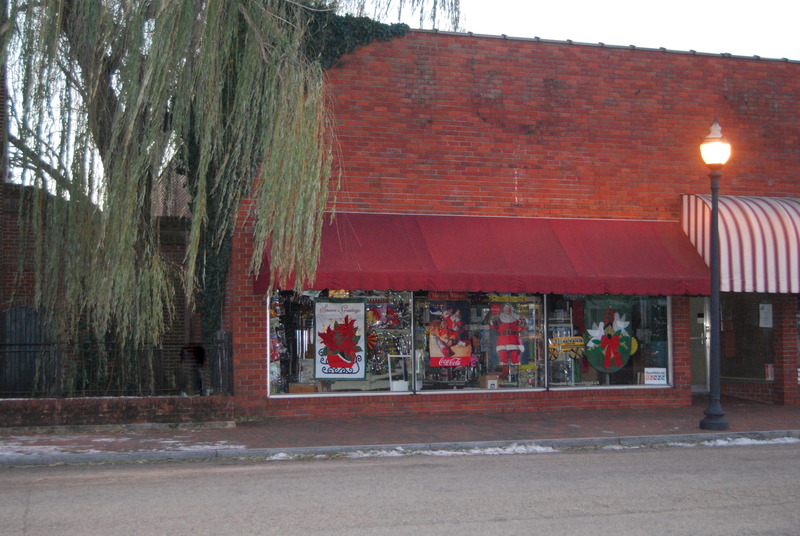 You knew it was Christmas time when you came to town and the decorations were up on Main Street. Now there are garlands and red bows on the lamp posts. The buildings remain, although they’re home to different businesses. The decorations have changed. Sky King is no longer on tv, and there are no gray woolen leggings in my closet (thank goodness). But it’s still Christmas in Smithfield.